Notes: The CB Micro Mayfly is one of Mike Mercer's most popular patterns. Mike is one of the managers of The Fly Shop in Redding, CA and one of the premier fly tiers. He developed this pattern while fishing the Madison River in Montana. The water he fished was too fast and shallow for standard mayfly nymph patterns. Weighting the nymph with split shot also caused constant hang ups. Mike resolved this problem by creating a pattern which sinks quickly due to the thin profile and heavy copper bead. The preferred hook is a TMC 921, which is actually a dry fly hook but has a short shank length and a wide gape, that will allow a bead to get around the bend of the hook. The CB Micro Mayfly utilizes stripped Peacock Herl ribbed with a fine Silver Wire for the abdomen. This gives the fly a slender profile and the appearance of segmentation. The silver wire ribbing helps strengthen the stripped herl from getting broken and unraveling. The pattern also uses 3 Pheasant Tail fibers for the tailing material. The fibers form a splay by the thread tension at the base of the tail and will undulate when retrieved from a splay to a single silhouette due to the nature of the material and how it is attached to the hook. 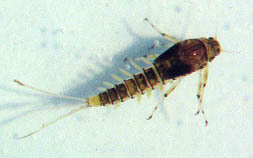 A wingcase is formed over a dubbed thorax and is covered by a drop of epoxy, which is a Mercer feature used on many of his nymph patterns. Different colors of dubbing materials can be used for the thorax. The olive is used for baetis and the brown is used for PMD or Callibaetis. 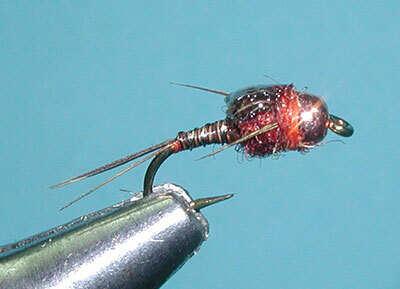 Variations utilizing Ultra wire for the abdomen give the fly some extra sinking ability. 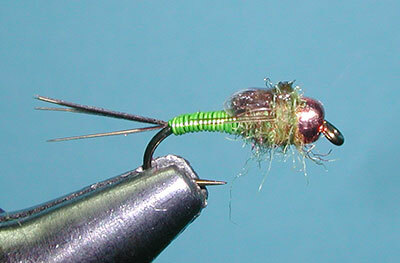 The Chartreuse Wire Micro Mayfly is actually a good pattern for Green Rockworm Caddis Pupa. 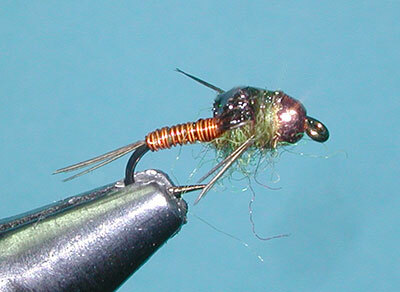 For smaller sizes, # 20-22, substitute a glass bead for the copper and use partridge fibers for the tail and legs. 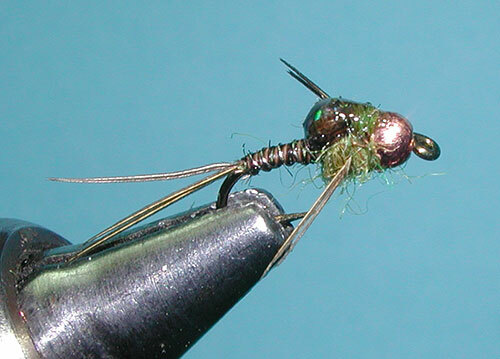 The CB Micro Mayfly is marketed by many of the flyshops throughout the Sierras. It is primarily used as a dropper under another nymph or indicator dry fly.